It came without warning. 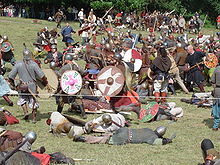 Innocent citizens were going about their lives when Vikings suddenly appeared from nowhere and took everything of value. It is a common tale that was repeated too many times in history, but the most recent raid reportedly comes from last week in Minnesota where citizens learned that they will have to foot the bill for much of a new stadium — despite the belief of most citizens that they had blocked such an effort. Advocate groups are calling a recent deal with the team as nothing more than a “real estate scam” in which the owners of the Minnesota Vikings are going to tap Minnesotans for hundreds of millions of dollars to build a new stadium. The owners themselves are flush as is the NFL generally. Owners are seeing massive profits while NFL lawyers are threatening anyone who uses even the symbol of the NFL without paying them. At the same time, however, they are demanding that taxpayers given them hundreds of millions of dollars for a new stadium. Thus, as NFL owners sue people for even using the term “Super Bowl,” they expect financially strapped citizens to fork over hundreds of millions of dollars. Behind the deal is the owners — real estate developer Zygi Wilf and his five partners who bought the team in 2005 for a reported $600 million. It is now worth $179 million more in roughly six years. Even if you count the seventh year, that is $25 million a year in just the value of the franchise and not counting the revenue generated by the team. While a poll showed 68 percent of citizens opposed public funding, politicians appear ready to sign the deal with the owners. Politicians often embrace new stadiums despite studies that show that it is the owners not the public that derive the most benefit. Highly profitable teams routinely go to taxpayers to pay for newer stadiums. Yet, it allows politicians to be seen supporting the team and Gov. Mark Dayton (D) is no exception. Yet, in 1997, Minneapolis voters voted to pass a referendum requiring their approval of any stadium deal. Dayton, therefore, should redirect over $300 million in Minneapolis taxes to the stadium — money that was supposed to pay off the city’s convention center. The end run by Dayton has enraged some taxpayers and hopefully will trigger a frank discussion of the real benefits to taxpayers in giving such windfalls to NFL owners. The owners are demanding that taxpayers pay 60 percent of the cost of the $1.1 billion stadium despite the fact that the state has had to shutdown critical services last year due to its financial crisis. What is astonishing is that professional teams demand newer stadiums even before the old stadiums are paid off. For example, in the case of the Meadowlands Stadium, New Yorkers were still carrying about $110 million in debt on the old Giants stadium when they broke ground. The old stadium is now a parking lot. The scene is not pretty however as this picture demonstrates as the owners and Dayton presented their proposal to the taxpayers of Minnesota. The Minnesota Vikings and the Green Bay Packers. Nothing in common except for a border. In my small town, Mr. & Mrs. Smith ran a small business. Tragedy struck a local family, and a mother with two small children was widowed. Mr. & Mrs. Smith offered her a job even though they didn’t need any more employees. Mr. and Mrs. Jones started a new business in my small town. My family shopped at their store even though we could have got better stuff cheaper a few miles farther down the road. They were members of our church. Someone with a MBA or a degree in modern economic theory would certainly chide Mr. & Mrs Smith for not maximizing their profits, and certainly criticize my family for not seeking greater utility with our money. In my small town, MBAs and Economic degrees were tools, not a life philosophy; otherwise, humans are but capital, and their labor only an input. It is a soulless religion. It destroys communities. That’s the end game of gobalized free trade and corporate capitalism. It’s why NFL owners are more petulant than their players. Public funding of stadiums for privately owned teams isn’t socialism. If the teams were owned by the city or state, public funding of stadiums would be socialism. Common ownership and management of resources for the public good is the salient feature of socialism. Building stadiums for private owners, as studies have shown, don’t benefit the public but rather benefit the private owners. Privatized profits and socialized risks are a function of corporatism and fascism, not socialism. That being said, public funding of stadiums for teams with private ownership should be illegal.